Simple remarkable! New horizons will be reached with this mare, she has unlimited potential as a broodmare and a show mare. All kinds of trot, snort and show attitude! 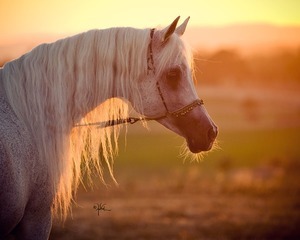 Available with a breeding to an SMF stallion, we suggest either Ali Saroukh or Sayo Sahran SMF. Malak is an amazing mare, seriously amazing. She can absolutely fly, as if on air her movement is so light and elegant. She carries a huge tail, always like she is waving a flag! I love this young mare even thugh she is considered a filly until four years of age you can easily see she will be a large bodied mare, very complete with a beautiful head, big eyes, good ears, small muzzle and elegant chiseling on her face whihc adds to her expression. They do not come much more complete than this mare. New photos in August after Jenni Ogden does a shoot, really looking forward to seeing her in this series! Malak has in her short two years attended the annual Santa Ynez Valley Foal Show twice and in June of this year the Egyptian Event all the way across the country to Kentucky. She handled both with great panache and showed herself quite well. Maybe not quite enough stand up in the center ring which was new for her but she will come to the party as this is a show filly...she loves it! Always in the hunt in the show ring! Doug Dahman trains her and she is one of his favorites! Well, Jenni Ogden along with her husband, Paul, came for the annual Arabian Breeders Celebration in April right after the Los Vegas World Cup. They took photos of many of the horses, with Paul and Henry along with Alec from our staff helping to handle. We concentrated on the younger horses but with a few stallions thrown in as well. Malak has wonderful movement and she enjoyed the whole photo process. She also loved being presented at the Celebration. Henry and I have either she or her full sister, Mouneera SMF available for sale. 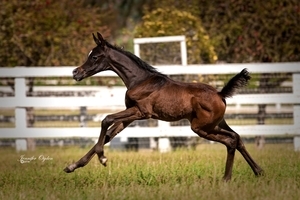 Either filly is the type for a foundation mare and show quality besides. What a difference a year will make! Today March 23rd I took my camera out and played with this filly. She is now a steel grey, with black mane and tail, much improved over last years dark brown coat. Lovely expression, very feminie and great big dark eyes with a beautifully chiseled head. This is a great nick between Ansata Majdiya and Majestic Noble SMF. Mouneera, the full sister to Malak is interestingly a rose grey in color and Malak is a black grey. Both fillies have good width between their eyes, large eyes, tiny muzzles, fine skin and an overall harmony. They are balanced and harmonious fillies. Malak may have the edge on a higher neck set but both have a lovely clean throat latch and good length of neck. Their bone is good and feet too! Movement is superb. 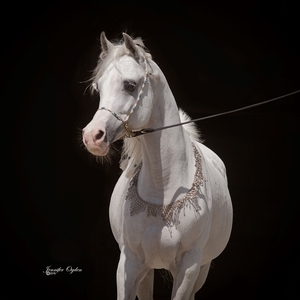 Malak SMF (Majestic Noble SMF x Ansata Majdiya by Ansata Iemhotep from Christie Metz on Vimeo.